First deployed throughout New York City’s subway and bus system in late 2014, the Metropolitan Transit Authority’s (MTA) Courtesy Counts placard campaign centers on subway etiquette. The colorful placards are illustrated with cartoon-like figures in various situations, ranging from the straightforward “Keep the Sound Down” to the slightly cheekier “Don’t Be A Pole Hog”. There is one instance, however, where the MTA parts company with the campaigns largely straightforward tone. This is the placard calls attention to the well-known subway misbehavior of “manspreading”. Whatever motivates this posture–a desire for comfort or a need to assert male privilege–the placard itself turned the campaign viral. In fact, according to lexicographer Katherine Martin it may have even have helped popularize the word “manspreading”, despite the curious fact that the copy doesn’t use the word. Instead, it employs the more gender-ambiguous message of “Dude… Stop the Spread, Please”. The message is accompanied by a figure with legs spread in a manner annoyingly familiar to straphangers everywhere. 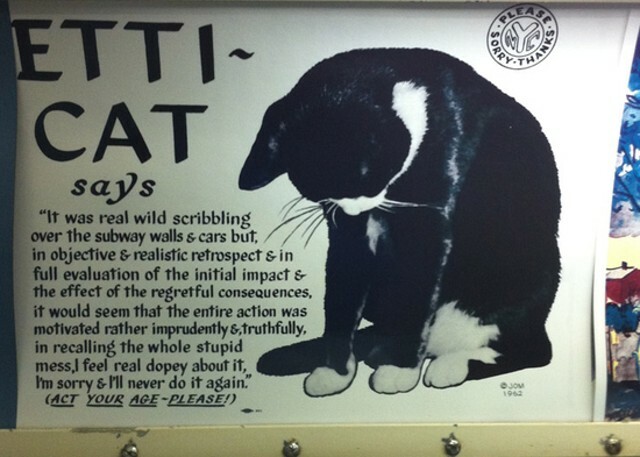 The popularity of this one placard, however, should not outshine the overall quality of the campaign–a campaign that trumps two previous MTA efforts to curb bad subway manners–the Subway Sun and Etti-Cat. Discounting the fact that a demeaning tone of voice is probably not the best way to get buy-in from vandals (or anyone for that matter), the verbose, ampersand-riddled writing is impossible to assimilate at a glance. Courtesy Counts avoids these mistakes. And while it may not have riders rolling in the aisle with laughter, it demonstrates that a campaign with a clean, direct, and slightly humorous tone can be right on track. Taylor Coe is a language-loving online marketer whose expertise includes content development, social media marketing, and SEO/SEM for organizations such as the Oxford University Press. His work has appeared in various online publications, among them the OUPblog, Popmatters, and Slate. Taylor received a B.A. in literature from Hamilton College with additional studies at the University of Edinburgh and Columbia University.